Posted: June 1, 2010 1:52 a.m. Updated: June 1, 2010 4:55 a.m.
Students walk with posters at Newhall Elementary School’s mini-Relay for Life fundraiser on May 14. 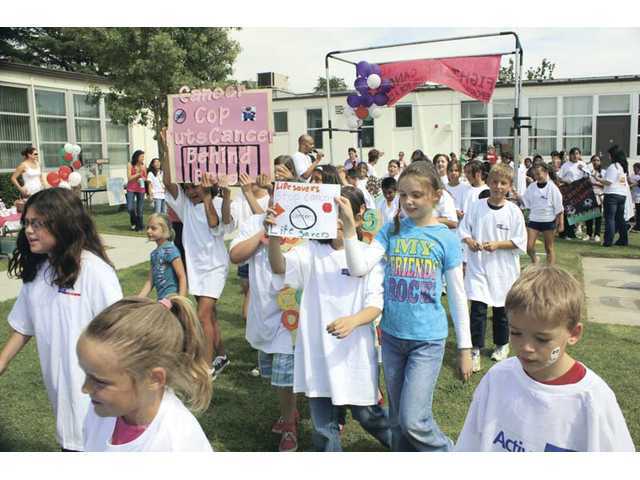 Kids are affected by cancer too, and the students at Newhall Elementary School responded generously to the American Cancer Society's SCV Relay For Life by creating their own mini-relay the week before the community event. About 150 participants, including students, staff members and parents, stayed for an hour after school to participate at Newhall's mini-relay. The theme, "Create a World with More Birthdays," was one the kids could identify with. Classes were encouraged to make a poster with the name of their class team and put it on their door prior to the relay. Then the kids carried their poster when they walked their laps. Some of the team names on posters included Cancer Cops - Let's Put Cancer Behind Bars, Mrs. Sudik's Cancer Fighting Super Heroes, Critters for a Cure, Cancer Kickers, "Kinder Cares, Hammer Out Cancer, Mrs. Davis Da Vincis Fighting Cancer One Brush Stroke at a Time, and Mrs. Dashnaws Tiny Da Vincis - Helping Paint a Brighter Picture. One class had a poster that said "Change for a Change" and had a jar attached. At the mini-relay, the kids took the poster around and raised more money by asking people to put their change in the jar. 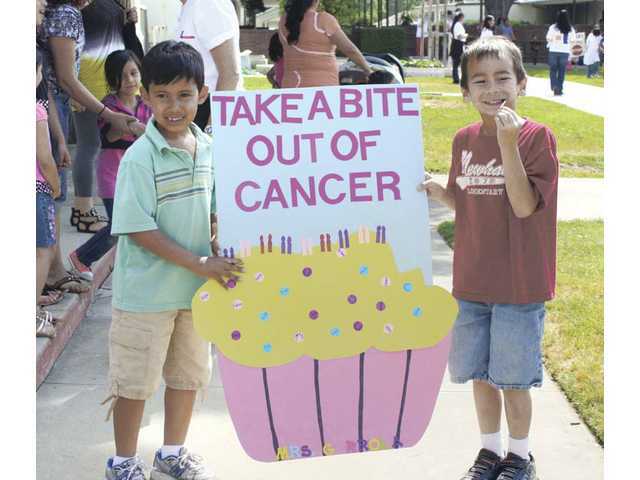 Another poster had a big cupcake with a bite missing that said "Take a bite out of cancer." Newhall's mini-relay started with a change drive before the final event. The first week, when I picked up the money from the classrooms, there were more than 58 pounds of coins, along with several bills. The Newhall Eagles continued to do the change drive until May 21. With what was collected in our change drive, mini-relay and what was raised at the big Relay For Life, the school raised a total of $2,107.38. Some of the classes had some unique fundraising outside the classroom. One class made games and packaged them up to sell at our relay. A couple of moms helped their kids' class raise money by selling paper cupcakes that kids could put either their name on or the name of someone they wanted to remember or honor whom was touched by cancer. Those cupcakes were put on a large bulletin board at school that said "Create a World with More Birthdays." The bulletin board was covered with the paper cupcakes. At the mini-relay, we had some games and other booths. Featured were face painting, hotdogs, popcorn and a booth to do luminaria bags for display at the community Relay For Life. Toys for a Cure set up a booth to sell toys and donated all the proceeds for this event. One of the classes held a bake sale and another class sold items students brought to donate. 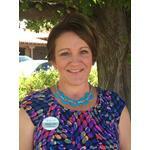 Kymmer Crookston was the coordinator for the mini-relay at Newhall Elementary School.